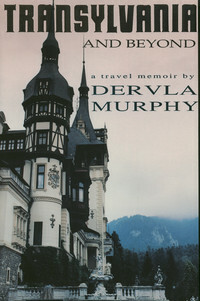 Astonishingly, Dervla Murphy managed to write a 235 page book on Transylvania without using the word 'vampire' even once. It is technically possible to explain this phenomenon by the book's publication year, 1993 being long before a worldwide fever turned vampires into a guarantee of commercial success. Somehow, though, I doubt this reasoning. Dervla Murphy does not strike me as someone eager to exploit teenage fashions. Perhaps this is why I find her writing so refreshing. If not vampires, then what is Transylvania and Beyond about? In one way, it is a typical Murphy-esque travel memoir. What started as a holiday trip, accompanied by various misfortunes from the very beginning, developed into a fully fledged love affair with Romania in the moment of transition between dictatorship and, well, something else. Eventually, a book was born. I have to confess that prior to reading Transylvania and Beyond I knew very little about Romania. Somewhere in the bottom right corner of Europe, capital: Bucharest, all names end with -u. As in Ceausescu. I haven't become an expert overnight, but Murphy's fascinating travelogue has added some flesh and bone to the handful of facts I had already possessed. Transylvania and Beyond focuses on Romania's period of uncertainty right after Ceausescu's fall. Inevitably, it is full of politics. It is hard to expect a nation to think about anything else right after a revolution. In 1990 and 1991 Murphy could only try to guess what will be Romania's political future, but she was able to and she most definitely did provide a bitter-sweet image of a society just released from under a crunching regime. Bitter because poverty and suffering were only too real. Small spoon of sweetness comes from snapshots of hospitality, generosity, ingenuity enforced by lack of comforts and picturesque remnants of pre-industrial pastoral life. I'm sure Romania is now much different than it was twenty years ago, probably much happier, too. Still, I was glad to discover this well-written, colourful account of the country's turbulent past. Oh, I'm not done yet with my library's supply of Dervla Murphy's books. More coming soon.